Engineering Technology Associates, Inc. (ETA), Troy, MI, will demonstrate its BSE-in-NX blank-size engineering module for the NX environment. It’s a complete toolset for accurately predicting flat-blank profiles, optimal nesting layouts and forming feasibility for 3D part models, designed for users of Siemens’ NX digital product-development software, via an icon on the NX toolbar. 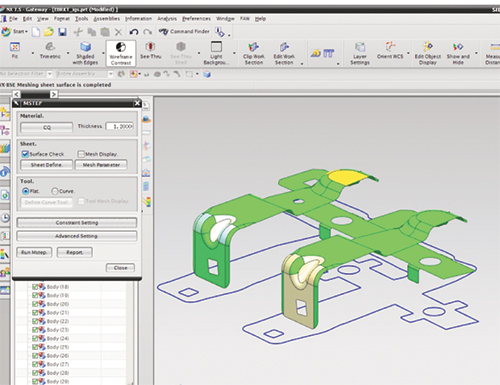 BSE-in-NX can be used by cost estimators to calculate blank outlines and determine ideal nesting layouts and material usage for accurate quoting, and by product designers to evaluate the formability of new designs. The functions are available within the NX user interface and operate directly on the NX model without data translation. The BSE-in-NX module can analyze and determine accurate blank profiles for even the most complex part geometry, including components with significant material stretch or undercut conditions. It also features an integrated nesting solution, including options for 1-up, 2-up, 2-pair, mirrored and multiple blank nesting configurations. Simulation results of part formability indicate the potential for cracking, thinning and wrinkling. Final reports then are automatically generated to summarize the estimated blank size, ideal nesting parameters and associated costs.